Students looking for colleges in Hawaii should start with the StepUp website sponsored by the Hawaii P-20 Partnerships for Education. This is a comprehensive college planning website with the usual timelines, application tips, and information on financial aid. The site doesn’t have its own college search function, instead it links to the College Board. The website includes the UH College Application Tutorial, an event calendar, and a list of outside links organized as resources. Users can also find information on special programs such as Health Careers Opportunities Program and Engineering Summer High School Internship Program. Students should also visit the Hawaii Community Foundation Scholarships website. You have to register to search and apply for scholarships. While there isn’t one website covering transferring from a community college to a four-year institution, you can get information on transferring to the UH system at the University of Hawaii System website. 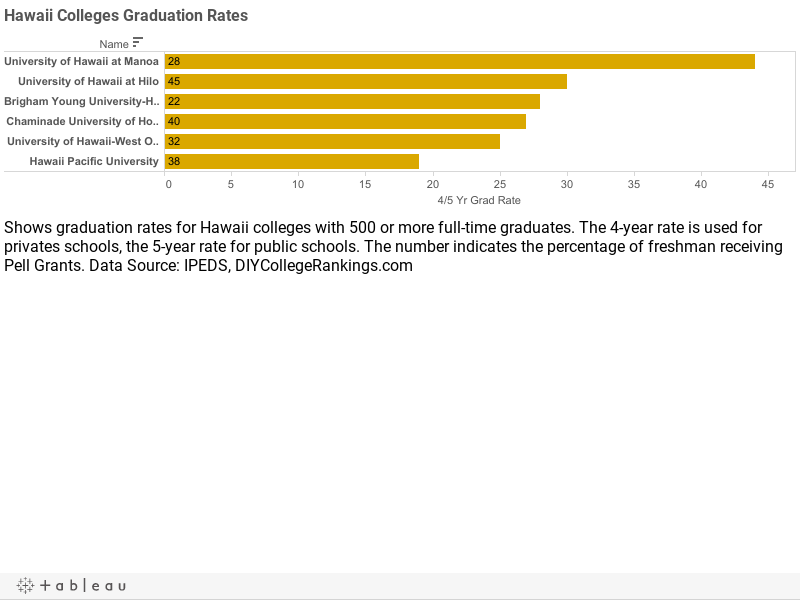 There are seven four-year Hawaii Colleges with 500 or more full-time undergraduates according to the Integrated Post-secondary Education Data System. Approximately 31 percent of students attend one of the three private Hawaii colleges while 69 percent of students attend one of the four public institutions. The private colleges have an average four-year graduation rate of 24.7% and the public universities have an average five-year graduation rate of 33%. None of the Hawaii colleges meet the DIY College Rankings 50-50 profile requirements. College-bound seniors in Hawaii had an average of 18.2 ACT Composite score with a 16.9 for English and 19.0 for Math. The 75th Percentile scores were a Composite of 21, 21 for English, and 22 for Math. A total of 6 colleges ACT 75th% Composite scores were at or above this level.